The Gb interface is part of the packet radio data network (GPRS) in GSM, it sits between the BSC and the SGSN and carries subscriber data headed to and from the internet. Connect one of the GTH's E1 interfaces to the E1 (or T1) interface carrying the Gb interfaces. You typically do that at a cross connect panel, using a G.772 monitor point. The Gb interface uses frame relay on E1. Different sites use different configurations of timeslots. One common setup is to use timeslots 1--15. Another common setup is to 1--15 + 17--31. The GTH can handle any setup. The C version of save_to_pcap can currently only convert MTP-2, not frame relay. If you want it extended, send mail. 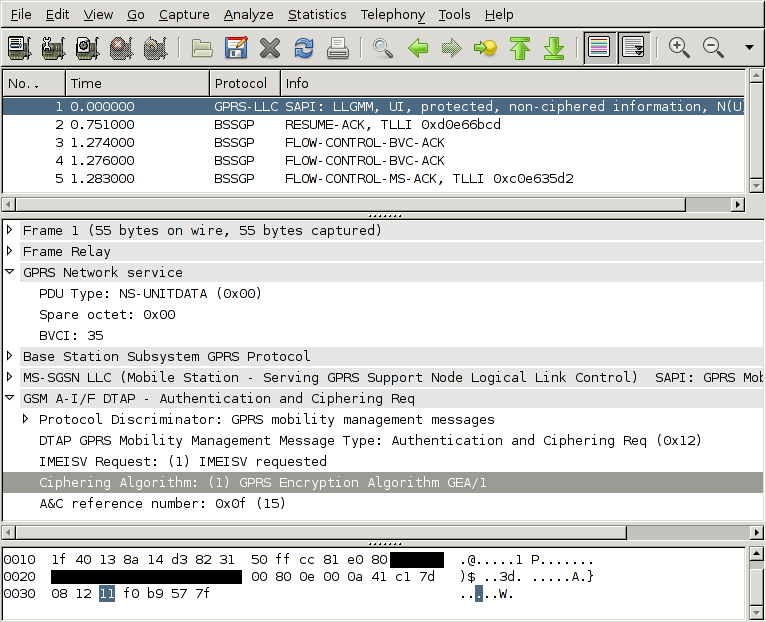 By default, wireshark decodes frame relay as 'FRF 3.2/CISCO HDLC'. That's not quite what we want. Go to Edit/Preferences/Protocols/FR and change the encapsulation to 'GPRS Network Service'. Now you get full decoding.